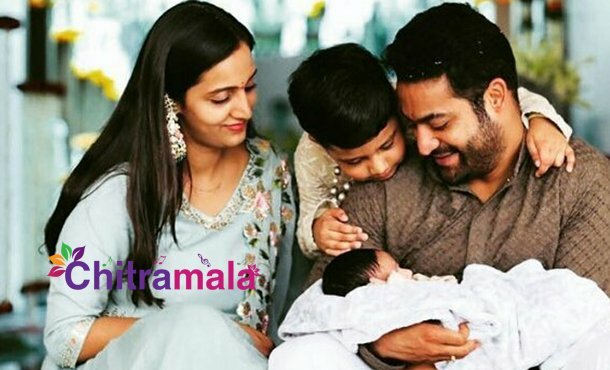 Young tiger Jr NTR’s second son named as Bhargava Ram and Tarak himself revealed this news through his social media page and he also posted a family picture. As per the reports the naming ceremony function held today in Jr NTR’s house and a newborn named as Bharagava Ram. Have a look at Jr NTR’s little son Bhargava Ram along with his brother Abhay Ram. Jr NTR is currently busy with the shooting of his new movie titled Aravinda Sametha Veera Raghava and it is being directed by Trivikram Srinivas. Pooja Hegde playing the female lead role opposite NTR in the flick.